Still more new or reinvented restaurants have opened this season, so I continued my mission to check them out and report to you. This blog features Provença. Provença is a new restaurant that is located next to the Wall House museum on the La Pointe side of Gustavia where the Wall House restaurant used to be. Under new ownership, the menus for both lunch and dinner are creative. 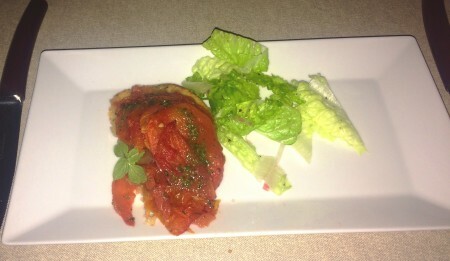 On our first visit, we shared the Mediterranean Crisp Tomato Tart Provença appetizer and enjoyed it very much. 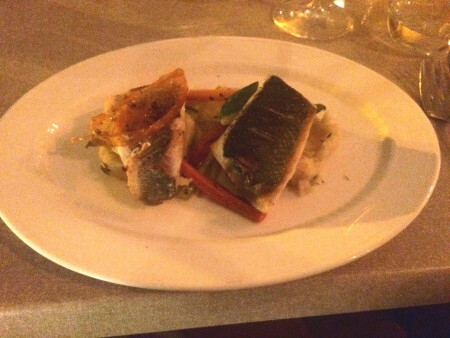 The Sea Bass was flaky and flavorful. Magda Votava, our St. Barth concierge and restaurant reservation guru, received the following review from one of our clients who dined there over the holidays. 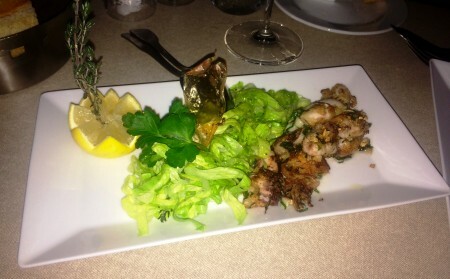 We shared the “Fresh Baby Octopus, just jumped with Garlic and parsley” to start – it was outstanding! Ellen ordered the “Duck Magret, Topping and sauce, Your Choice of Sides and Sauce” with French Fries and Porto and Fig sauce – the dish was perfectly prepared, but felt like the plate was not complete – it would have benefited from including a vegetable and a starch instead of only one side (vegetable or starch). Note: If you want a second side, you can order one for 6 euros. Look for the Cicada sign to the left of the item. It indicates that the recipe is an authentic one from Provence. 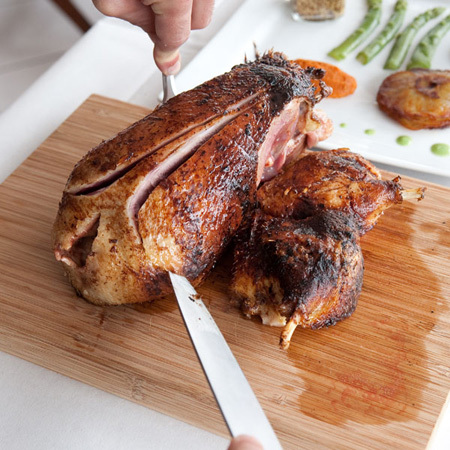 Chef de Cuisine, Thomas DESTINÉE and Second de Cuisine Cédric LABLANCHE create flavorful dishes. General Manager Marie PECOUL is from Provence and explains the menu in detail. On our second visit, we too shared the octopus appetizer and it was indeed outstanding. 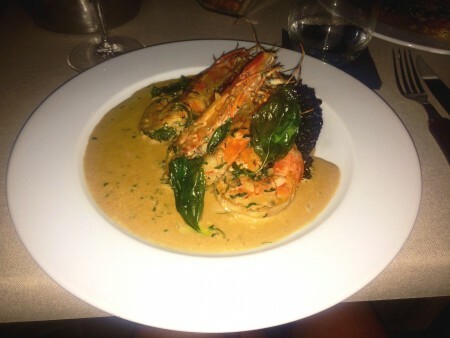 For our main course, we each chose the Prawns Flambéed with Pastis, and “Forbidden” Black Rice. We learned that during the days of the Ching and Ming dynasties, Forbidden Rice was solely reserved for the Chinese Emperors. People thought it guaranteed well-being. In due course, commoners were allowed to consume the rice. Now a favorite dish, it is reputed to promote longevity and good health. It is delicious as is the shrimp. Give Provença a try and let me know your thoughts. As far as the “Seen” part of this blog is concerned, I think you will enjoy the following photos of what you can stumble upon while you are out and about in St. Barts. 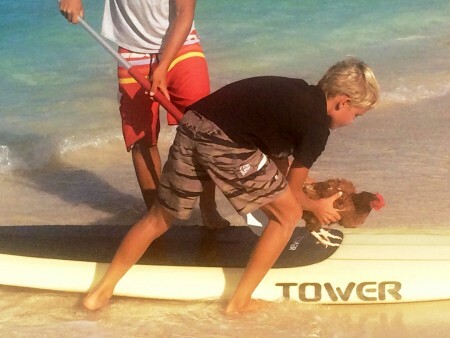 January 24, 2015 Paddle boarding with a very much alive chicken St. Jean Beach! My hour is up. Time to head for the beach. 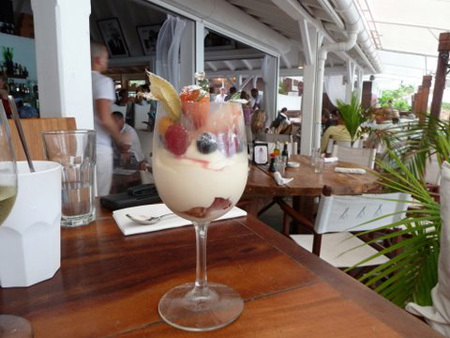 Those of you who normally travel to St. Barts in Value Season often expressed your disappointment that the Wall House restaurant traditionally closed on the first Sunday in June and did not reopen until mid-October which meant that you were never able to try it. You are in luck! Owners Bernard Tatin and his son Julien are keeping the restaurant open during the summer! The food is delicious and there are luncheon specials daily. 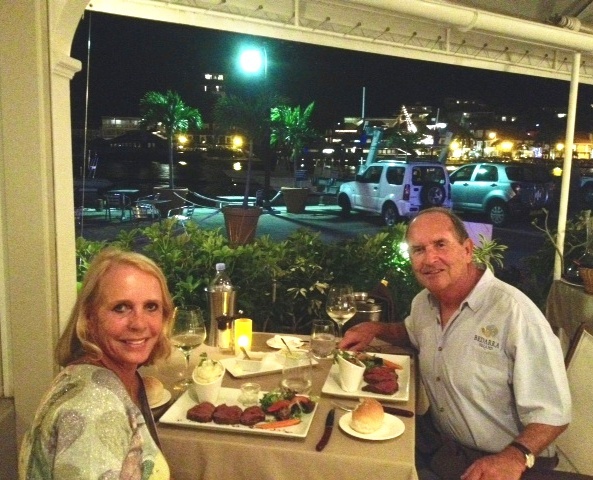 We had dinner there a few days before we left and thoroughly enjoyed the chateaubriand for two. On the other hand, Le Massai was forced to close May 12 due to the owner’s renovation of the parking area which he will be upgrading. The restaurant will reopen in November and I am sure it will be as wonderful as ever. On another note, I am sad to say that Le Tamarin closed for good on April 28. The good news is that I saw former owner Toc happily working at Jean Claude Dufour’s new restaurant in Saline, L’Esprit. 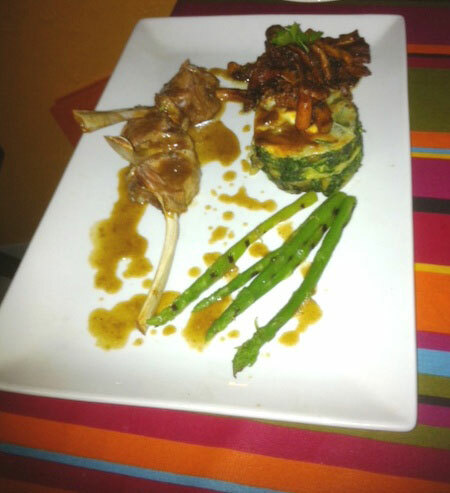 You MUST try L’Esprit! Jean Claude is such an outstanding and creative chef. He loves having his own place; you can see into the kitchen and watch him use his skills as he formulates the mouth-watering dishes that you are about to be served. He is planning on adding a nice bar area in the garden which will be a nice addition. I just learned that Harbour’s has been sold. 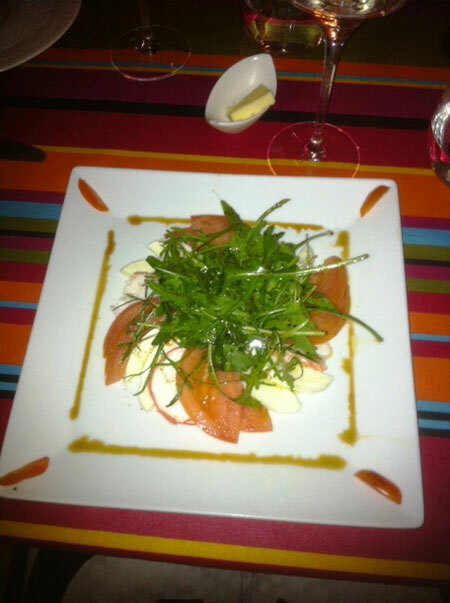 It originally was called La Saladerie, then Harbour Saladerie and finally Harbour’s. 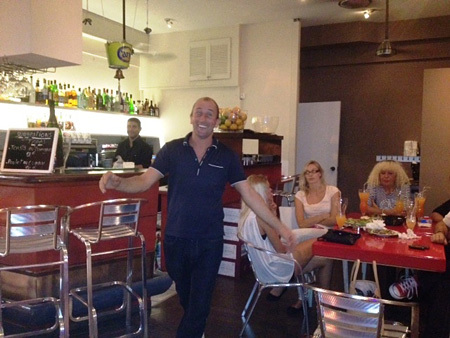 So my good friends and owners Thierry, Gilles and Patrick are gone as is the wait staff. The chef has remained with the new owner who, as rumor has it, is from Paris. I will check it out and keep you posted. Les Soldes! We Americans are so used to being able to advantage of merchandise sales that businesses in the US have whenever they want to entice a customer to shop in their stores, one would expect the same to be true in other countries. That is not the case in France (and therefore not in St Barts). The word “sale” (solde) is not allowed into the vocabulary of French retail businesses except for two defined periods of the year. If a shop dares to do so, it will be fined by the governmental authorities. Most of us can’t believe that Big Brother can interfere and tell French businesses what they are allowed to do if they want to have a sale. There’s an agency known as the “General Directors for Fair Trading, Consumer Affairs and Fraud Control.” It has the power to monitor all shopkeepers to ensure that they strictly abide by these French laws. It is up to the local “prefects” to decide on which dates the sales must take place …so much for free enterprise. 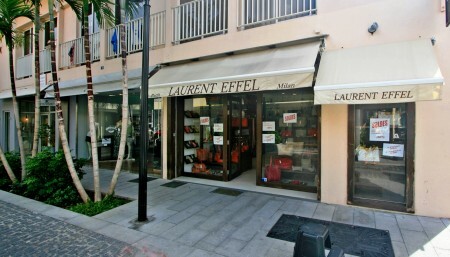 Les Soldes in St. Barts are from May 5-June 9, 2012. Don't miss out! The sale dates in St. Barts are different from those in Paris, for example. That city held its sales in January. Of course January is high season in St Barts, so the island waits until after that period is over. 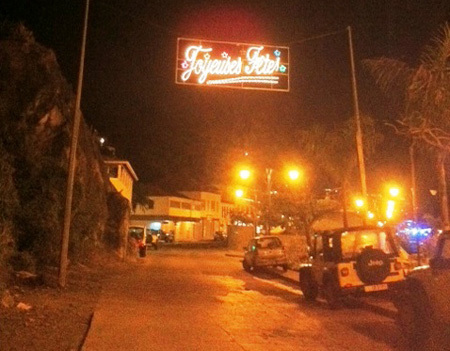 This year the Prefect declared that St. Bart’s 5 weeks of Les Soldes must take place May 05-June 09, 2012. I was lucky to be there at the time, so I hurried down to Gustavia the very first day to see what kind of bargains I could find. Believe me, I was not the only one to do so; it looked as if every person who lives on the island waited for this event to happen. Paying full price is just not what people want to do, no matter where you live. It’s not too late to take advantage of Les Soldes. We have some perfect villas for those of you who want to shop ‘til you drop. Why not plan a girlfriend’s getaway? 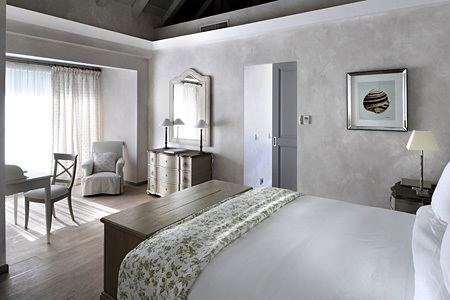 Contact reservations@stbarth.com and you will be on your way to a shopper’s paradise. I am back on Cape Cod for a couple of weeks. I will be returning to St. Barts with some of my St. Barth Properties USA staff after attending the high school graduation of one of my grandsons June 01. This is the time of year when we do our villa and hotel inspections (We do this again in November) so as to ensure that we can continue to assist you with the all important decision of where to stay when you are in St. Barth. Our knowledge of the hotels and villas is what makes us the experts in our field. I also will be gathering material for our next Live Your Dream® catalogue which we always debut at our annual Beachside Bash, a party that we throw each November to jumpstart the season. The festivities continued throughout the week. 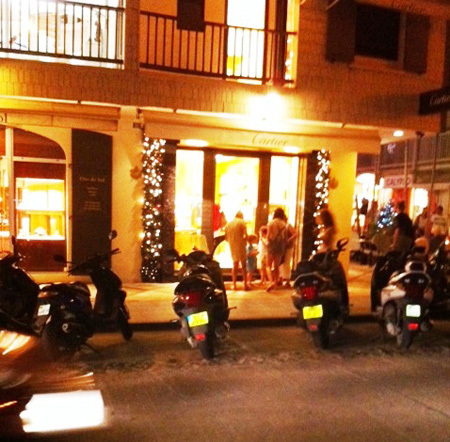 Many shops hosted wonderful cocktail parties throughout Gustavia. After hosting our weekly cocktail party at Bonito restaurant on Tuesday, we continued on to a cocktail reception at the elegant jewelry store, Chopard because I had received a very nice invitation to attend. So many people were there – the Champagne was flowing and yummy hors d’oeuvres were being passed. After that we strolled along the harbor and decided to stop in to say Bonsoir to Brice. 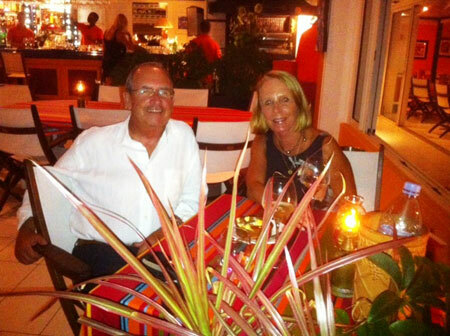 He used to work at the Tom Beach hotel’s Pink Parrot Bar that is situated in the sand by its La Plage restaurant. Brice recently purchased La Cantina and I wanted to check it out. (That’s part of my job so I can update my “Helpful Hints” which many people refer to as their “bible”). 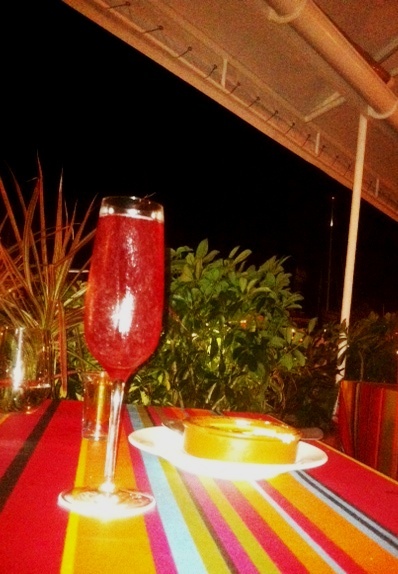 La Cantina is very a popular spot with reasonably priced drinks and tapas. It has a view of the harbor and is a great place if you are into people-watching. 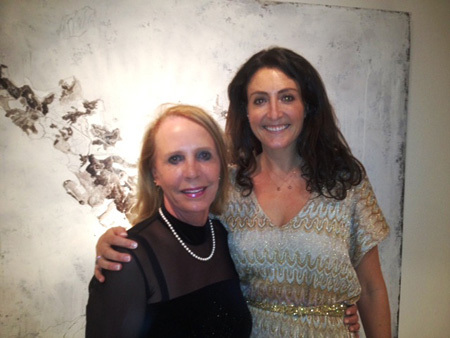 The next evening we were invited to attend the Grand Opening of Natalie Clifford’s new contemporary art gallery, Space SBH, which is located in the Carré D’Or shopping area. It was packed and once again the Champagne was flowing. Flute in hand, I walked around and marveled at featured artist Dominique Rousserie’s work. 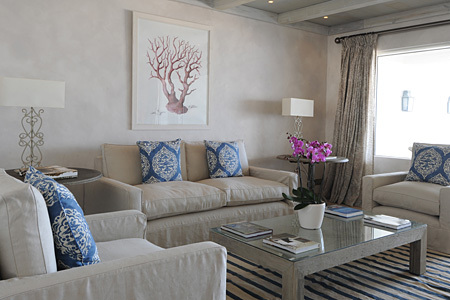 Some of his work that is on display through January 14, 2012 features paintings of St Barth which would complement anyone’s décor. I particularly love the one that shows the map of St. Barth. With New Year’s Eve fast approaching, the island continued to bulge as more people were arriving by plane, ferry or yacht. 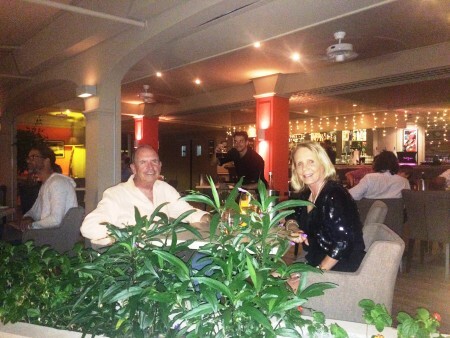 People just love to be in St. Barth at this time of year. Traditionally Steve and I always go to the Wall House for the evening. Julien Tatin and his father Bernard are such wonderful hosts. We gathered in front of the Wall House Museum for cocktail hour that featured an open bar and a wonderful array of passed hors d’oeuvres. 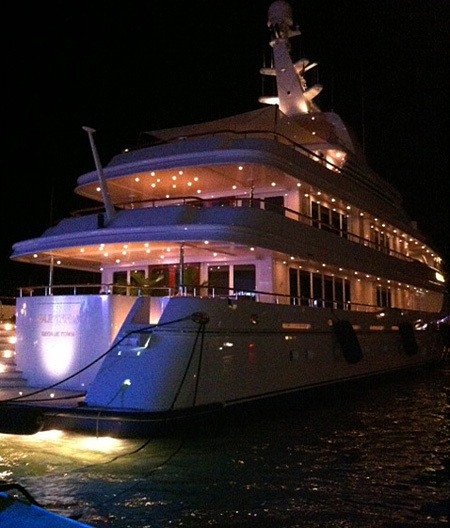 Yachts were berthed in front of us; the atmosphere was perfect. 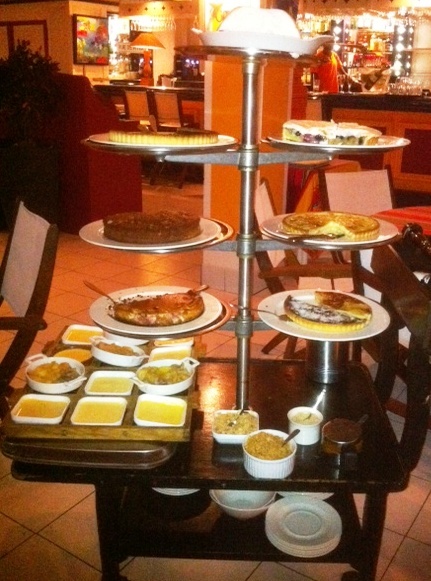 A delicious dinner in the restaurant followed. 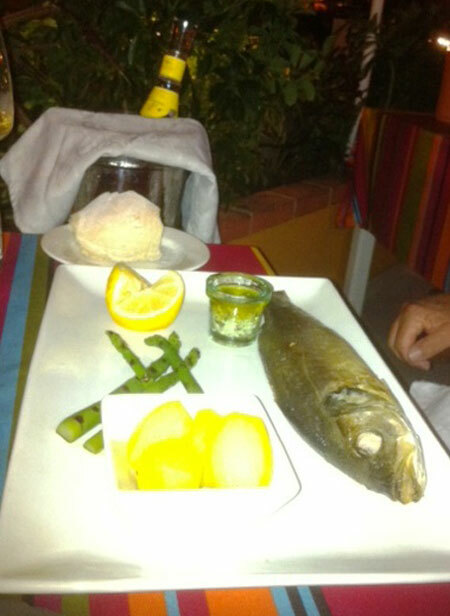 Courses including foie gras, fish and veal were served. We finished just in time to see the midnight fireworks. Everyone began kissing each other and while shouting Bonne Année! The sky was full of bursts of color and the yachts sounded their horns in approval. Happy New Year Everyone. I hope to see in St. Barts. 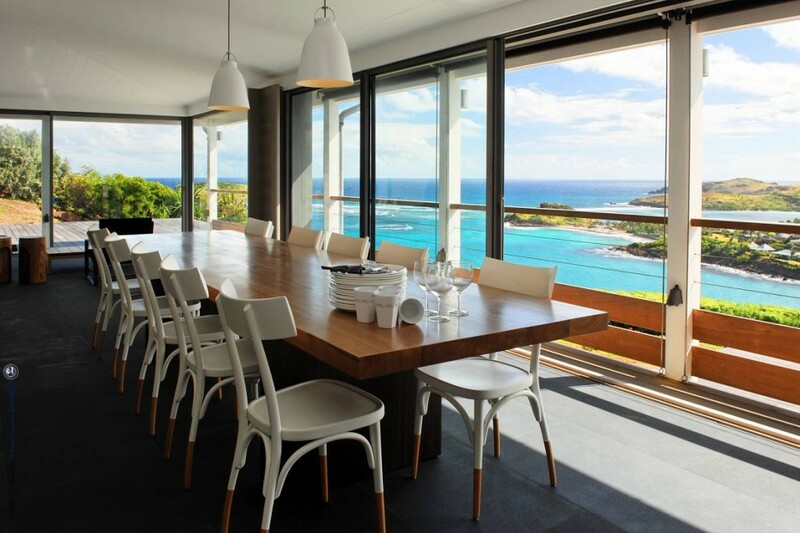 When you are ready to make your plans, email reservations@stbarth.com or call 1-800-421-3396. I forgot to tell you that I had a business (and pleasure) lunch with Pascale Minarro the Directrice of our St Barth office and Magdalena Votava, our Concierge. 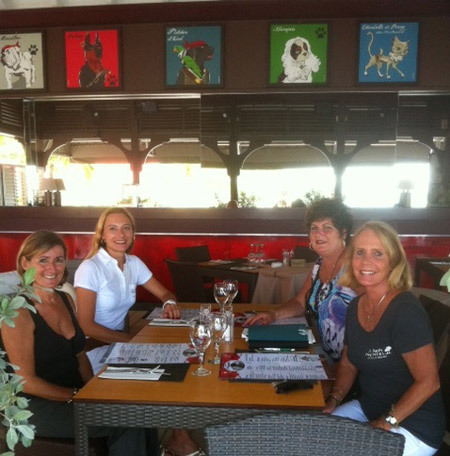 Paula joined us at the newly reopened La Route des Boucaniers harbor side restaurant that is now owned by Xavier Pignet of Dõ Brazil. I had been dying to try it and I am so glad that we did. The menu is varied and they offer lunch specials every day. Prices range from 10 to 20 euros each. (The dinner menu is different and very good, too.) The restaurant is completely remodeled; the bar was moved and the dining areas are more open so you feel more al fresco and can enjoy the view. We each tried a different item. 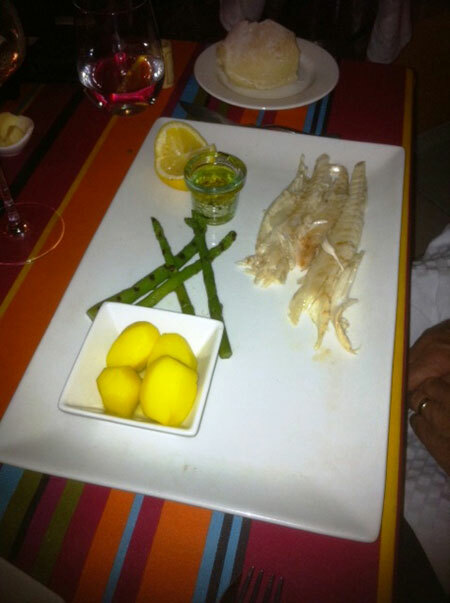 I had the Langouste Salad and it was quite good. 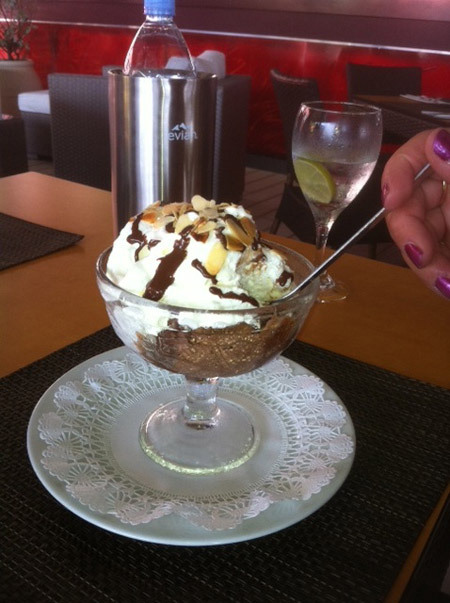 Paula and Magda indulged in the dessert—Yummy! Saturday afternoon I took a few hours off and went to St. Jean Beach with Paula. The water was divine. I noticed some camera equipment on the beach (This is fairly common but more so on Shell Beach). It turns out that Victoria’s Secret was doing a photo shoot featuring one of their top models, Candice Swanepoel. She really is stunning and we watched the entourage for a while. It’s quite a production just to get one shot. If you happen to read one of their next catalogues and you see her picture, try to notice if you recognize the beach in the photo. 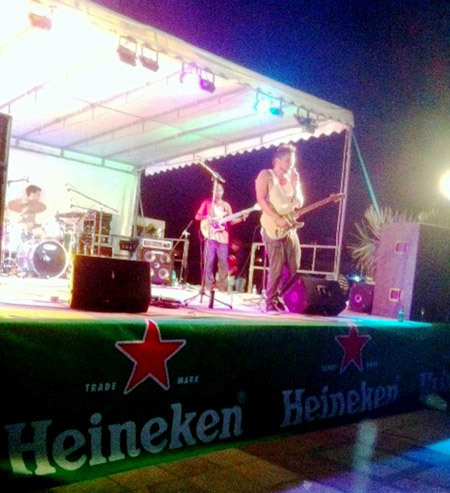 Saturday night was the Summer Sessions concert on the quai so we decided to go down to Gustavia early because DJ Alex Merrell was spinning at the new V Lounge. The what? The V Lounge aka the Voyageur Lounge… It is a gorgeous very elegant lounge for us “grownups” who can’t stay up until the night clubs get going at midnight and close at 4:00 am. 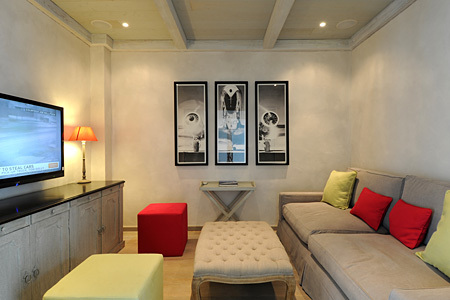 It is luxuriously furnished with white sofas inside and tables are located on the outside deck. The view of the harbor from here is outstanding. The bar is beautiful too. 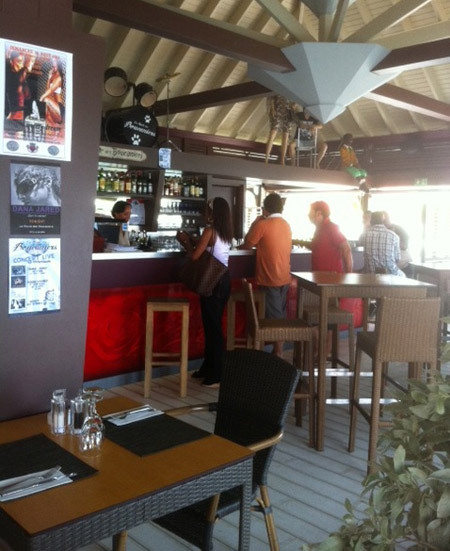 The V Lounge is located above the Yacht Club and La Marine in Gustavia and the fact that it opens at 7:00 pm is really great. People can go there for an apéritif then continue on to dinner or stop by for a digestif after dinner. 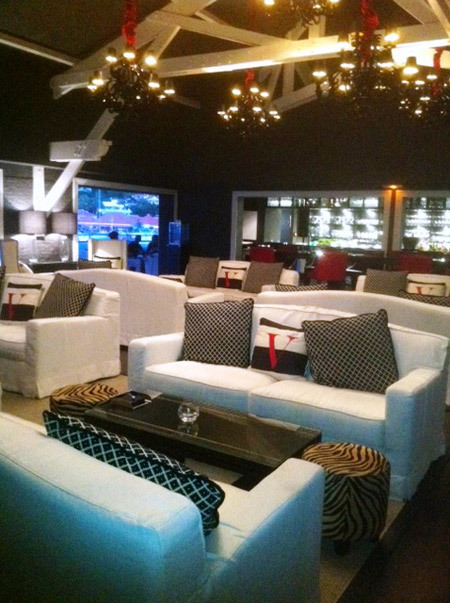 If you are looking for a great place to enjoy drinks and a light supper the V Lounge offers a wonderful selection of tapas. Open from Tuesday to Sunday 7:00 pm to 1:00am and they accept reservations. I think you are going to love this place. Paula and I had decided that we were going to hire a taxi to pick us up at Villa Everest. Our island office concierge, Magdalena Votava hired Karine Greaux who dropped us off at the V Lounge. Karine told me to call her 15 minutes before were ready to go home. So we were on foot and left the V Lounge to dine at the Wall House. The food was great per usual and we spent time talking to co-owner Julien Tatin. Julien and his co-owner dad, Bernard love St Barth Properties and our clients, so if you want to have lunch or dinner there, you can reserve a table before you travel or call Magda when you are on the island. She will make the reservation for you and you will receive a 10% discount off of the entire bill! Now that is a great deal. After dinner we walked over to the other side of the harbor to enjoy the music. Lots of people were there and the entertainment was great. Then I called Karine and she took us back to the villa. Bonjour from sunny St. Barth! It is another beautiful day in paradise! 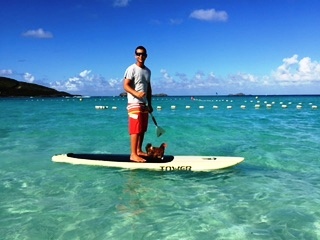 If you are celebrating President’s Day and have the day off, why not take the time to plan your St Barth vacation. Our office is open! 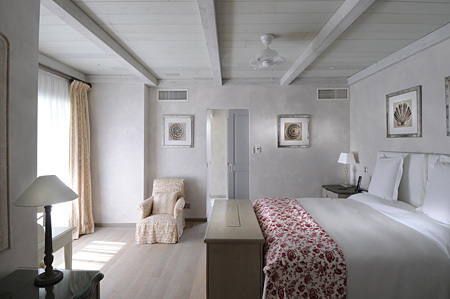 Just pick up the phone and call 1-800-421-3396 or email info@stbarth.com. 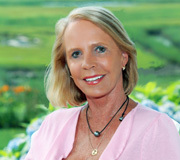 Anne, Julie and Kathy are ready to help you plan your holiday so that you can Live Your Dream®. Hope to see you soon! 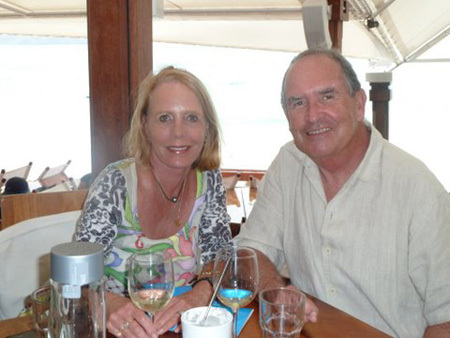 Steve and I celebrated Valentine’s Day at one of our favorite restaurants, the Wall House. Luckily we had a reservation because the place was sold out. We sat at “our table” and checked out the special Valentine’s Day menu. Diners had the option of ordering from it à la carte as it was not a prixfixe menu; they could also choose from their regular menu. 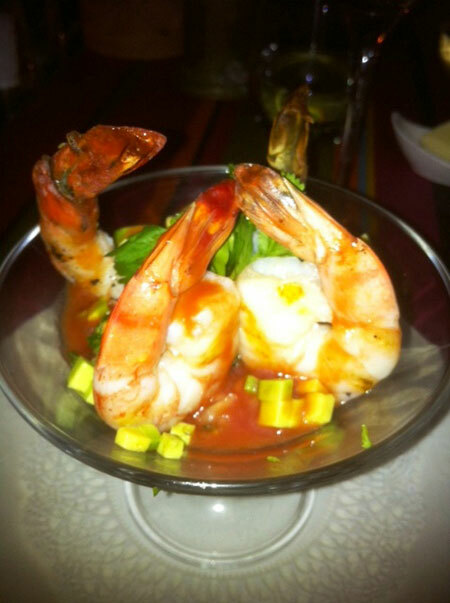 I began with their wonderful Jumbo Shrimp with Avocado Cocktail (15 euros) and Steve selected the Caprese Salad of Lobster, Tomatoes, Mozzarella and Baby Arugula (20 euros). Both of them were delicious. I decided to try their Valentine’s Special Carré de Veau à la Rôtisserie (Rack of Veal from the Rotisserie) accompanied by a homemade spinach and chestnut lasagna (34 euros) and Steve ordered the Mediterranean Catch (Sea Bass) which was also roasted on the spit and, served with asparagus, steamed potatoes and a lemon and tarragon sauce (24 euros). We enjoyed both very much. 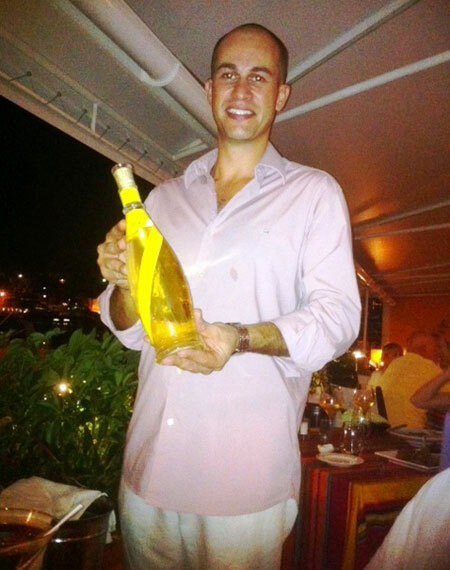 To accompany our meal co-owner Julien Tatin suggested DOMAINE OTT – BLANC DE BLANCS CRU CLASSE – CLOS MIREILLE 2008 (50 euros) and it was a superb blend from Provence. Along came the dessert trolley which was filled with so many yummy choices (9 euros each). We finally decided upon the Crème Brûlée. 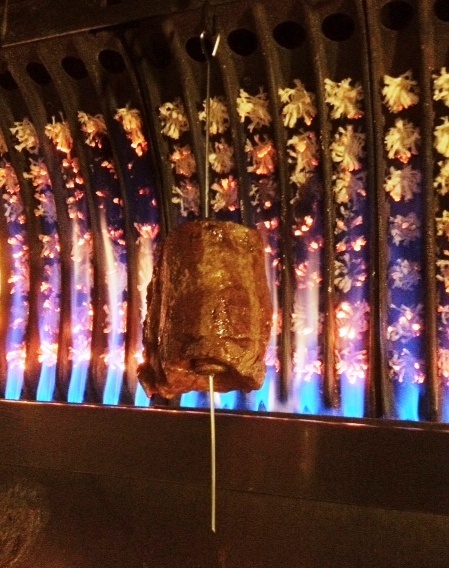 Our server flamed the torch over it while we looked on and watched the topping turn a light brown. Because we are a part of the St. Barth Properties family, we were offered their famous after dinner drink which is a Sparkling Wild Strawberry Coupe. It was the perfect complement to accompany our scrumptious dessert. 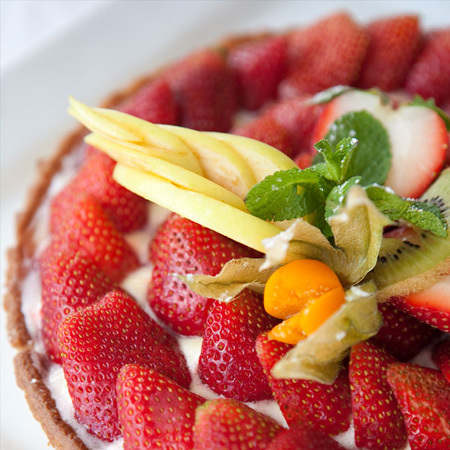 Now, if you are too full, you don’t have to order dessert in order to receive your complimentary Sparkling Wild Strawberry Coupe after your meal. All you need to do is be a client of St. Barth Properties and call our office at 0590 29 75 05 to make your reservation for you once you are on the island. 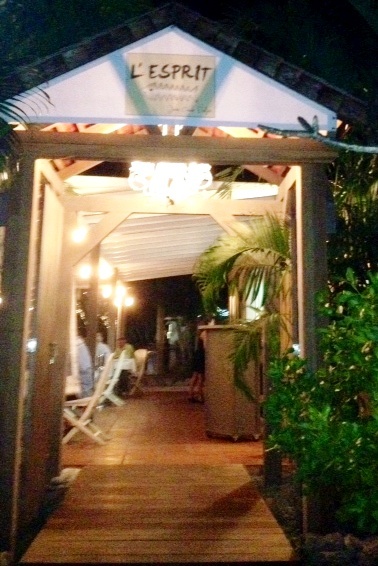 If you prefer to reserve your table before your departure, just email concierge@stbarth.com. I arrived last week and have been doing last minute villa inspections before they fill up for the holidays. There are so many beautiful properties. I am sure you will love staying in them. Villa Cosmos, a villa in Mont Jean that we sold three years ago, has just completed its renovation – it was worth the wait! Dream about: Working on your tan then jumping into the large heated swimming pool to cool off. 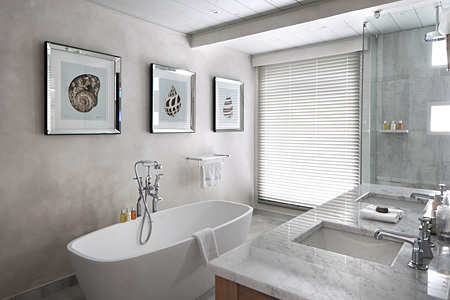 It’s in the details: Four en suite bedrooms are located in separate areas; Outdoor living spaces are everywhere. The decorations line the streets of Gustavia, the yachts were all lined up on the dock but a houle came down from the US creating large swells form the northwest so the yachts are temporarily moored just outside the harbor. 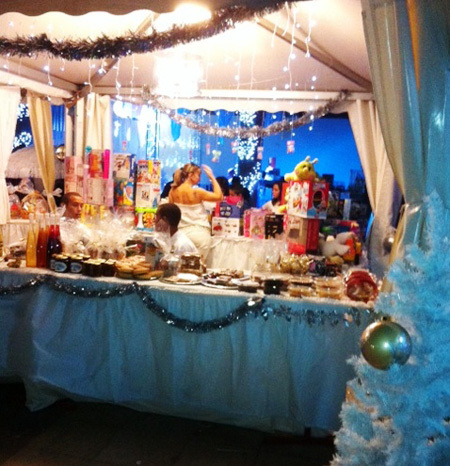 There is a Christmas Village on the quai where people can purchase some last minute gifts. The boutiques remain open and there is plenty of activity—window shoppers and buyers alike. This evening Steve and I will attend the 6:30 pm Christmas Eve service at the Anglican Church. It is my annual chance to sing Christmas carols and belt out those songs (I am a soprano and love to sing). Continuing the tradition we will head to the Wall House for dinner. People are raving about their new menu and the new chef who created it. Wishing you and yours a Merry Christmas and Happy Holidays. 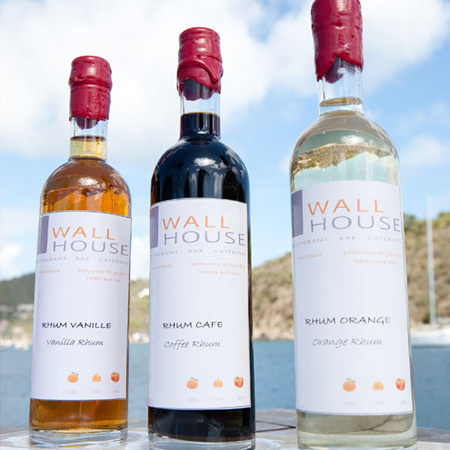 A few months back, I mentioned in my newsletter, Le Bulletin that I had a scoop for you regarding one of my favorite restaurants, the Wall House in Gustavia. Owner Julien has given me the go ahead to be the first person to let you know the big news. The Wall House will be open during the summer months! We always mourned the annual closing of the restaurant which traditionally began the day after the “Empty the Fridge” party that was always held on the first Sunday in June. We had to be patient and wait until October to have lunch or dinner there. 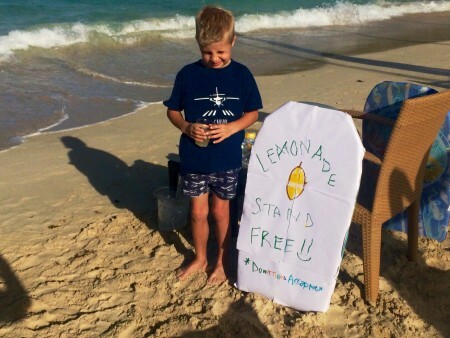 Our Value Season clients had to miss out on the experience…but no more! The Wall House will only be closed in September. It will be closed all day on Sundays (beginning December 1st 2010). Lunch: Noon – 02:30 pm and Dinner: 07.00pm – 10.00pm. They have some great deals at lunchtime and their 29 euros dinner special is a real bargain. 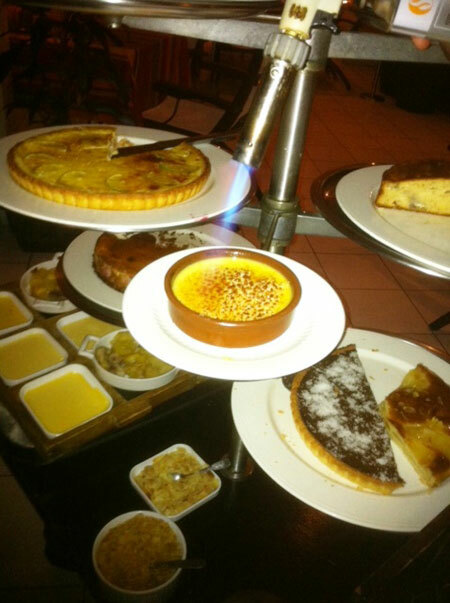 Don’t pass up the dessert trolley; the selection is outstanding. They are producing their own rums too! –vanilla, coffee and orange flavors serve as a digestif after dinner. 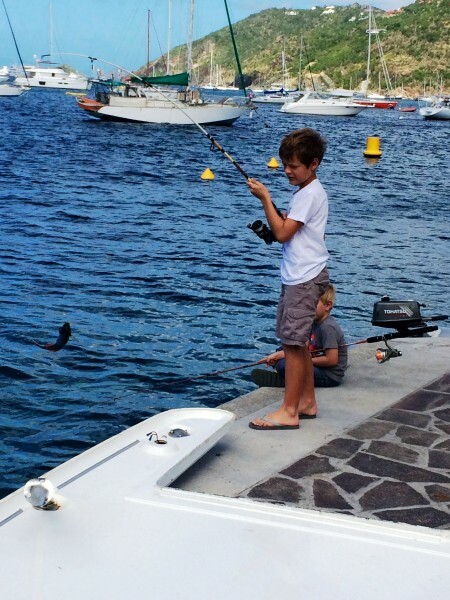 And …for clients of St. Barth Properties? Mention Peg’s Blog when calling our office in the US (1-800-421-3396) before you leave or our St Barth office while you are there (0590-29-75-05) to make your dinner reservation before January 31, 2011 and you will receive a complimentary apéritif!